England’s green and pleasant land conceals a peril that threatens our very futures, says scientist Dr Laurence Couldrick. Rainstorm by rainstorm, the land is washing away – and carrying a cocktail of chemicals to pollute rivers, harbours and even the sea. More than 38% of the soils on farms in the South West are severely degraded already. And before you shrug and leave it to the farmer, Dr Couldrick makes it clear this is everyone’s problem. 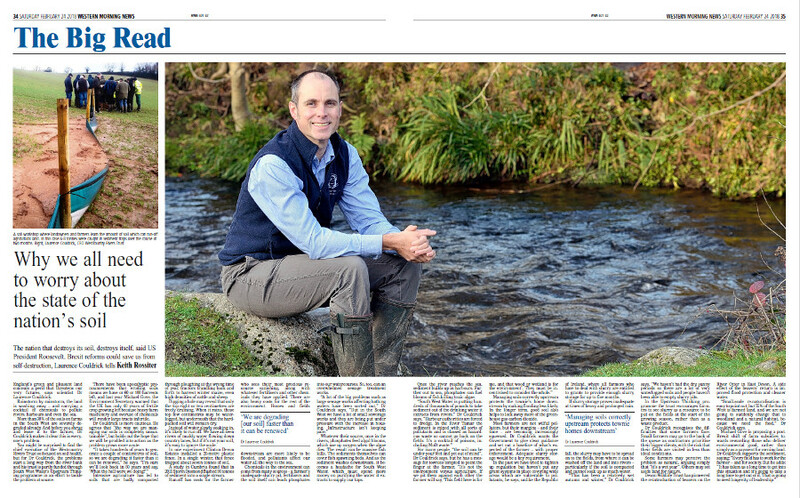 You might be surprised to find the chief executive of the Westcountry Rivers Trust so focused on soil health, but for Dr Couldrick, the problems start a long way from the river bank and his trust is partly funded through South West Water’s Upstream Thinking programme in an effort to tackle the problem at source. There have been apocalyptic pronouncements that eroding soils means we have or 60 or 100 harvests left, and last year Michael Gove, the Environment Secretary, warned that the UK has only 40 years of fertile crop growing left because heavy farm machinery and overuse of chemicals will render large tracts infertile. Dr Couldrick is more cautious. He agrees that “the way we are managing our soils is completely unsustainable”, but holds out the hope that we will be prodded into action as the problem grows more acute. Intensive agriculture has led to soils that are badly compacted through ploughing at the wrong time of year, tractors trundling back and forth to harvest winter maize, even high densities of cattle and sheep. Digging a hole may reveal that only the top eight or ten centimetres are freely draining. When it rains, those top few centimetres may be waterlogged, but underneath that the hard-packed soil will remain dry. Instead of water slowly soaking in, it’s likely to run off. 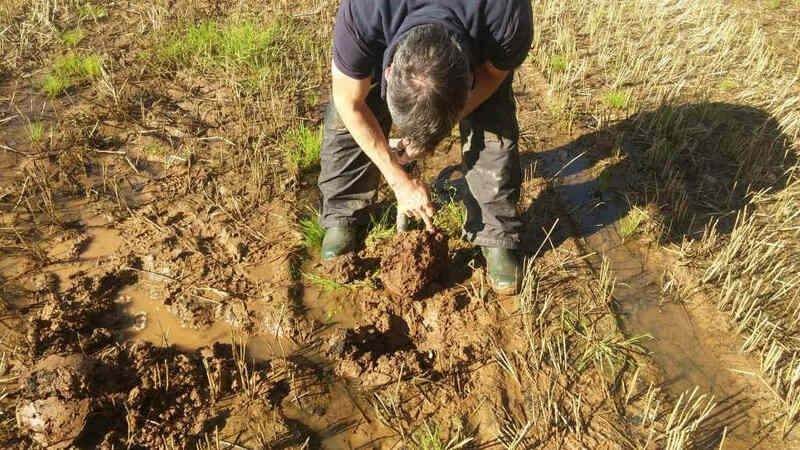 We have all seen rivers of muddy water flowing down country lanes, but if it’s not your soil, it’s easy to ignore the scale. In one experiment Clinton Devon Estates installed a 20-metre plastic fence. In a single winter, that fence trapped about seven tonnes of soil. A study in Cumbria found that in 2015 Storm Desmond flushed 84 tonnes of sediment into a single stream. Run-off has costs for the farmer who sees their most precious resource vanishing, along with whatever fertilisers and other chemicals they have applied. There are also heavy costs for the rest of the environment. Homes and fields downstream are more likely to be flooded, and pollutants affect our water all the way to the sea. Chemicals in the environment can come from many sources – a farmer’s inadequate slurry pit, fertilisers and the soil itself can leach phosphates into our watercourses. So, too, can an overwhelmed sewage treatment works. Whatever their source, once in the rivers, phosphates feed algal blooms, which use up oxygen when the algae dies. The result can be massive fish kills. The sediments themselves can cover fish spawning beds. And as the sediment washes downstream, it becomes a headache for South West Water, which must spend more money on purifying the water it extracts to supply our taps. Once the river reaches the sea, sediment builds up in harbours. Further out to sea, phosphates can fuel blooms of fish-killing toxic algae. Managing soils correctly upstream protects the townie’s home downstream by making flooding less likely. In the longer term, good soil also helps to lock away more of the greenhouse gas carbon dioxide. Most farmers are not wilful polluters, but their margins – and their time – are becoming increasingly squeezed. Dr Couldrick wants the Government to give clear guidance and set out a baseline of what’s expected of the farmer – with proper enforcement. Adequate slurry storage would be a key requirement. In the past we have tried to tighten up regulation but haven’t put any grant systems in place covering wide areas which are vulnerable to pollutants, he says, unlike the Republic of Ireland, where all farmers who have to deal with slurry are entitled to grants to provide enough slurry storage for up to five months. If slurry storage proves inadequate at times of heavy and prolonged rainfall, the slurry may have to be spread on to the fields, from where it can be washed off the land and into rivers – particularly if the soil is compacted and cannot soak up as much water. “This has been a relatively wet autumn and winter,” Dr Couldrick says. “We haven’t had the dry, sunny periods so there are a lot of very waterlogged soils and people haven’t been able to empty slurry pits. In the Upstream Thinking programme the trust encourages farmers to see slurry as a resource to be put on the fields at the start of the growing season, rather than as a waste product. Dr Couldrick recognises the difficulties that some farmers face. Small farmers may go to the back of the queue as contractors prioritise their bigger clients, with the risk that their fields are visited in less than ideal conditions. Some farmers may perceive the problem as natural, arguing simply that “it’s a wet year”. Others may set aside land for nature. Devon Wildlife Trust has pioneered the reintroduction of beavers on the River Otter in East Devon. A side effect of the beavers’ return is improved flood protection and cleaner water. “Small-scale re-naturalisation is easy to point out, but 75% of the South West is farmed land, and we are not going to suddenly change that to woodland and a natural habitat, because we need the food,” Dr Couldrick says.